FULL DESCRIPTION A rare opportunity to purchase a substantial four bedroom semi detached family house with accommodation of approximately 1,600 sq ft, situated just a five minute walk from Winchester city centre and the mainline train station. In addition to it’s convenient location for the many local attractions and amenities, the property also falls within the catchment area of highly regarded local schools. Whilst currently a wonderfully spacious home, it also offers great scope for improvement and further extension to the rear and in to the roof, subject to necessary planning consents. The accommodation comprises on the ground floor: Entrance hall, living room opening onto the dining room, conservatory, kitchen/breakfast room and cloakroom. 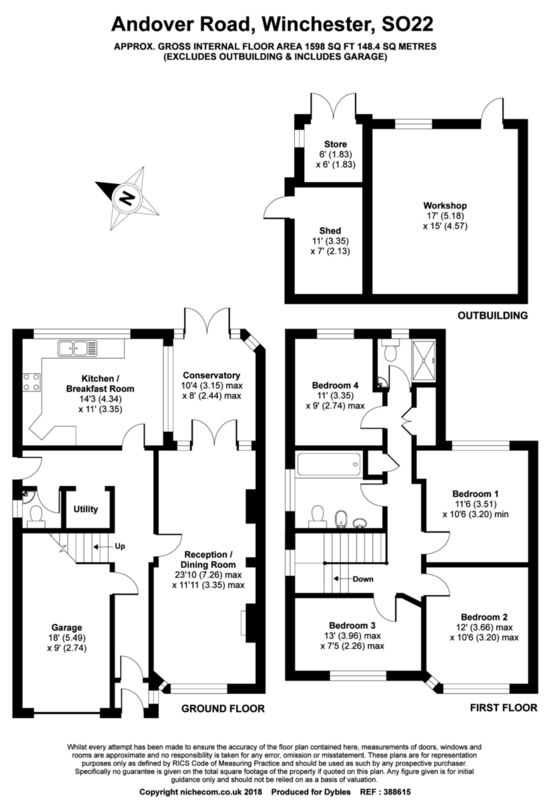 First floor: Four double bedrooms, large family bathroom and separate shower room. The home boasts large amounts of light flowing throughout, accompanied with fantastic open living space, it is ideal for entertaining friends and family.The property also benefits from double glazing and gas fired central heating. The rear garden is of a generous size, offering privacy and also includes a large storage shed. To the front of the property is a driveway for two vehicles leading to the single integral garage. The property is set behind a service road so additional visitor parking is also available here. Location is a key aspect of the home, being set off from the road ensuring tranquillity yet being such a short distance from the incredibly popular Winchester city centre. An internal viewing is essential to fully appreciate this excellent family home, the potential on offer and enviable location.